Description: Custom Development of a Premium Website tailored to your needs. Elegant and Flexible Professional Website for your Business, Entertainment, Service, Store, Blog, Portfolio or Personal website. 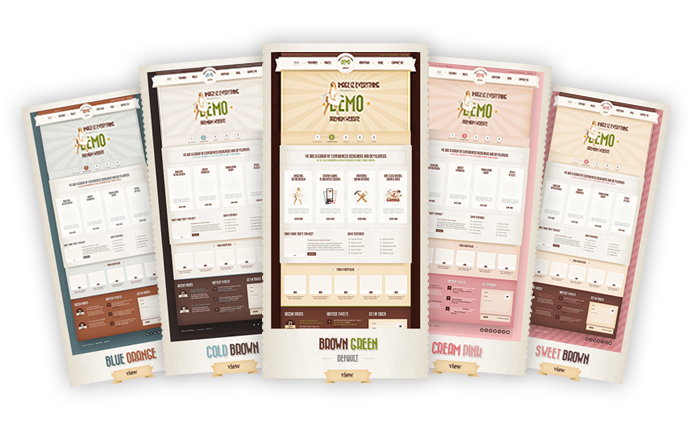 Your website would be customized to your taste & color scheme, and include your content. Click HERE to View a Live DEMO. 1) Pay Deposit (If you have a Coupon Code, enter it in Coupon Code field). 2) We custom develop your website. Time Frame: Approx 5 to 7 days. We offer Free Financing, via PayPal’s Bill Me Later®. Interested in purchasing this website package, but don’t have the money? Now you can get it Instantly with Free Financing. Get up to 6 months special financing. No Payments and No Interest if paid in full in 6 months on purchases of $99 or more. PayPal will pay the entire bill for you. Twitter, Facebook, Google+, Dribble, Vimeo, Skype, LinkedIn, Pinterest, LiveJournal, Tumblr, Behance, Paypal, Instagram, Delicious, Digg, Youtube, SoundCloud, Amazon, Beatport, iTunes. Blue Orange, Cold Brown, Brown Green, Cream Pink, Sweet Brown. Plus we can custom design a color scheme of your choice. Control every pixel of the website. This website can be translated to other languages than English. Besides our default font, you can choose one of the fonts from the Google Library of over 500+ Fonts. Stylish and useful, lots of widgets for any needs. You can easily create any contact form with different sets of fields. This website comes with custom post types to make posts more organized. Menu comes with 3 possible layouts: Logo Left, right & centered. You don’t need to edit core theme files to customize the website. This website comes with two fully-functional content areas. You can add social buttons almost anywhere on the website. We can add custom patterns for header, background and content area, 6 patterns in total. Our contact form is provided with the reCaptcha feature to prevent spam.